A collection of colouring pages for students to use. This collection includes celebrations and special occasions, mindfulness colouring, colouring by numbers, animals, characters, settings and purposeful activities. Students will love spending time colouring in these engaging posters. 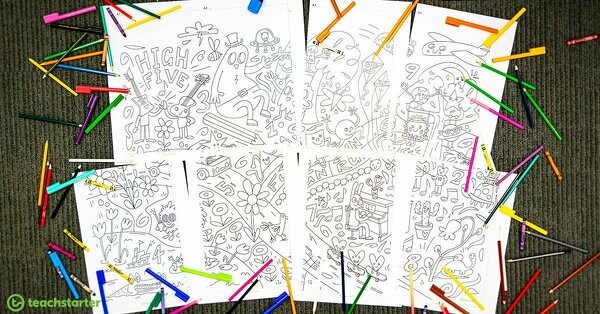 A set of four colouring pages to be used as a listening activity. A Christmas tree mindful colouring in sheet. A Christmas stocking mindful colouring in sheet. A set of four colouring pages to be used as speaking and listening activities. A lovely mindfulness colouring-in sheet. A fun mindfulness activity that involves colouring in and making a paper pinwheel. A set of 3 mindful Christmas colouring in sheets. Stop everything and check out this brand new resource! Break out the pencils and crayons - this Giant Colouring Sheet will make any classroom buzz. Stop with the tinsel, the glitter and bonbons. At least for a short while. Create some Christmas calm with these beautiful, mindful colouring-in sheets. As a parent with school holiday boredom in mind, I've compiled a list of six simple art and craft activities you can do at home with your kids, using some of the FREE primary resources available here on the Teach Starter website.